Another 100-Page Spectacular, and a sure call for my money and my attention. 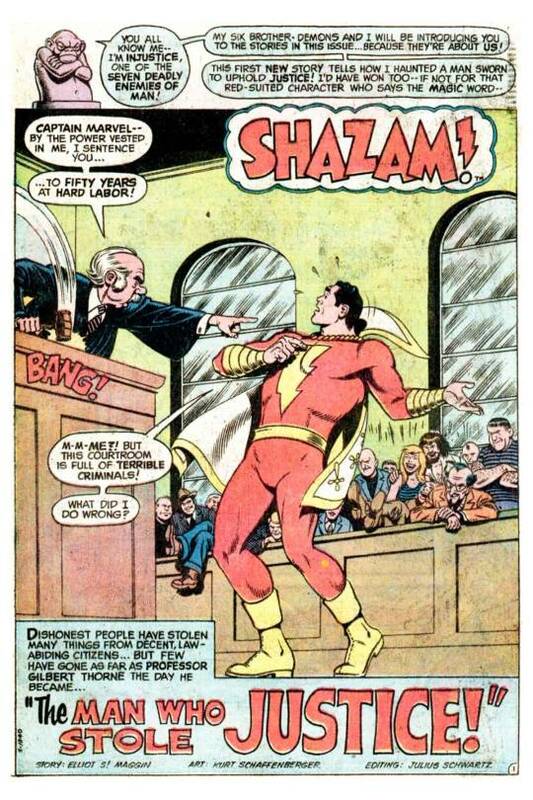 By this point the SHAZAM television series had begun airing on Saturday mornings. I watched it dutifully, but found it a bit dull. I could tell that it was trying to teach me things rather than just telling a story. And besides, Captain marvel in the series seemed a lot less powerful and capable than George Reeves’ Superman, then airing five days a week in reruns. 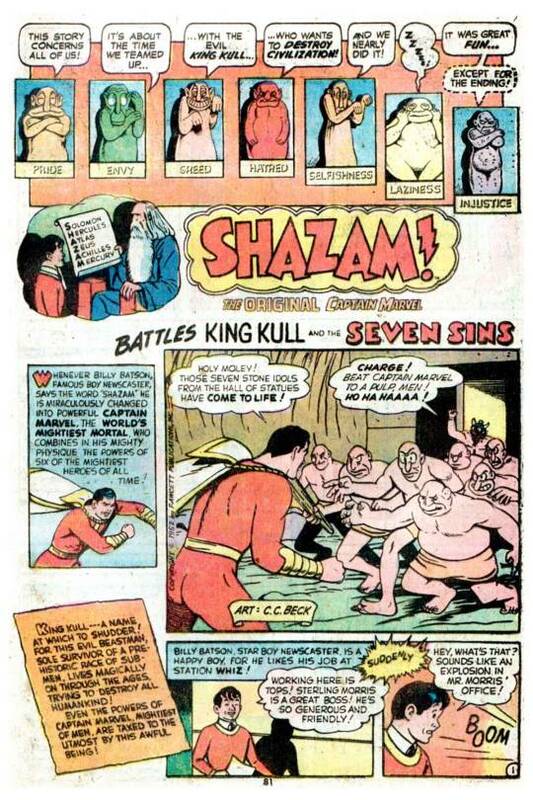 This issue used as its theme the concept of the Seven Deadly Enemies of man, those huge statues that Billy Batson would pass as he entered the old wizard’s secret underground chamber. The first story is a bit of a trifle from Elliot S! Maggin, but it contained a couple fun sequences, and nice Kurt Schaffenberger art. 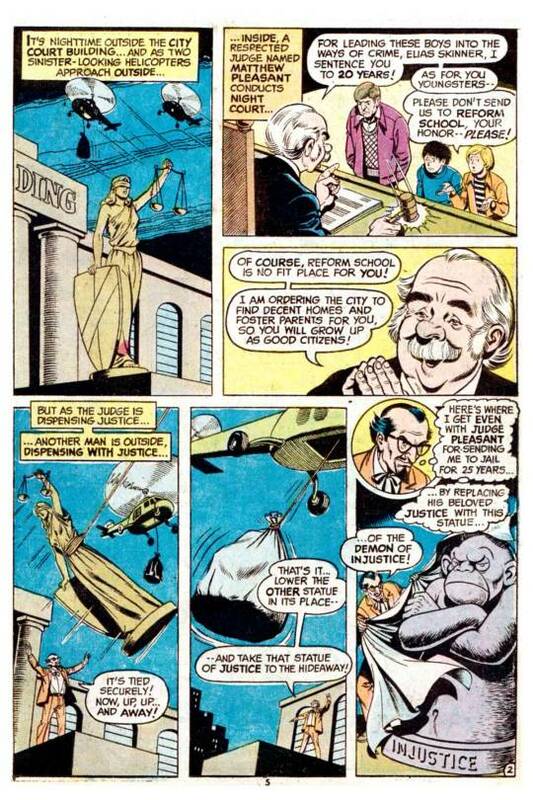 The premise of the story is that a villain steals the statue of justice that stands outside the city courthouse, replacing it with a demonic statue that’s filled with powerful electronics and a bomb. The statue has an effect on kindly Judge Matthew Pleasant, turning him into an aggressive firebrand who sentences people to prison willy-nilly. After collaring some criminals and bringing them to court for some reason, Captain Marvel becomes aware of the statue and the change in the Judge. 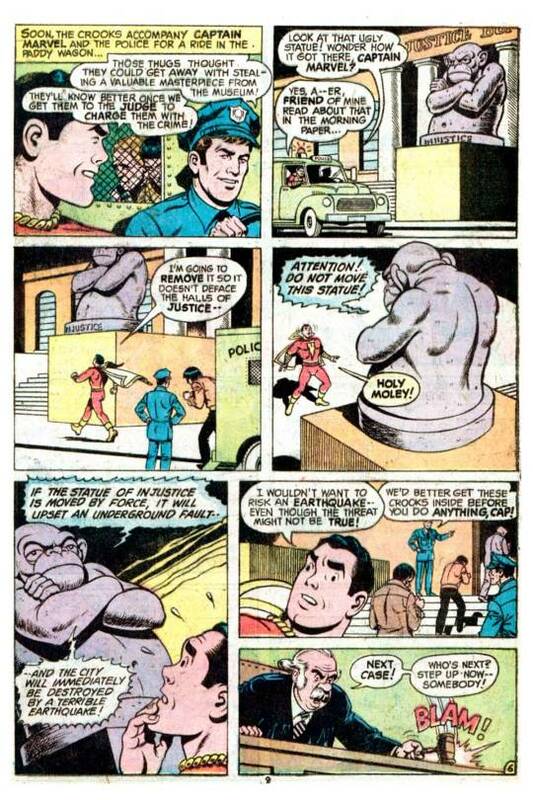 But the statue warns Marvel that if it is tampered with, it’ll set off an earthquake that’ll destroy the city. 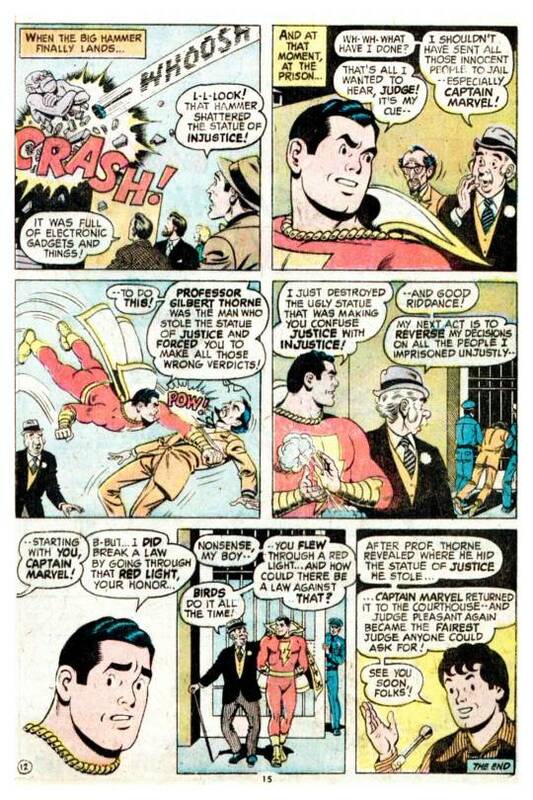 Standing before the judge, Captain Marvel finds himself sentenced to fifty years at hard labor for having flown through a red light in pursuit of the criminals. Law-abiding, Marvel has no choice but to go, and he makes short work of the rockpile. 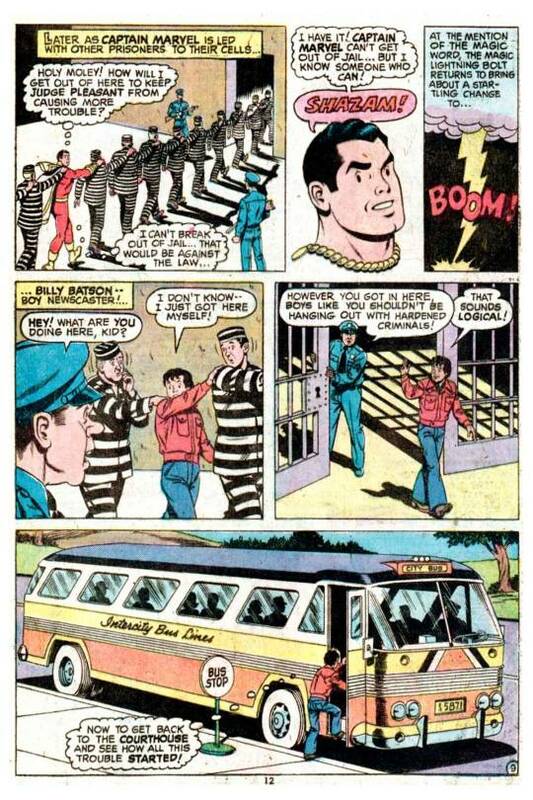 But he eventually realizes that his ticket out of prison is to transform back into Billy. Billy, at this point, had begun to be dressed more like his television counterpart. Upon his release, Billy does some legwork, discovering how the crooked scientist had set up the statue in the first place and what it was doing. Returning to the prison, Captain Marvel hurls a sledgehammer with such precision that it shatters the demonic statue at just the right angle to prevent it from setting off the earthquake. And with the Judge returned to normal, everything is wrapped up nicely. Then it was reprint time! First up was a three-part Marvel Family story in which the immortal Managers of Earth, who handle all of the millions of specifics about our planet, get into an argument about which of them is the most important. So they begin to start changing things–Milk becomes green, Newspaper becomes stone, and flowers smell like garlic. 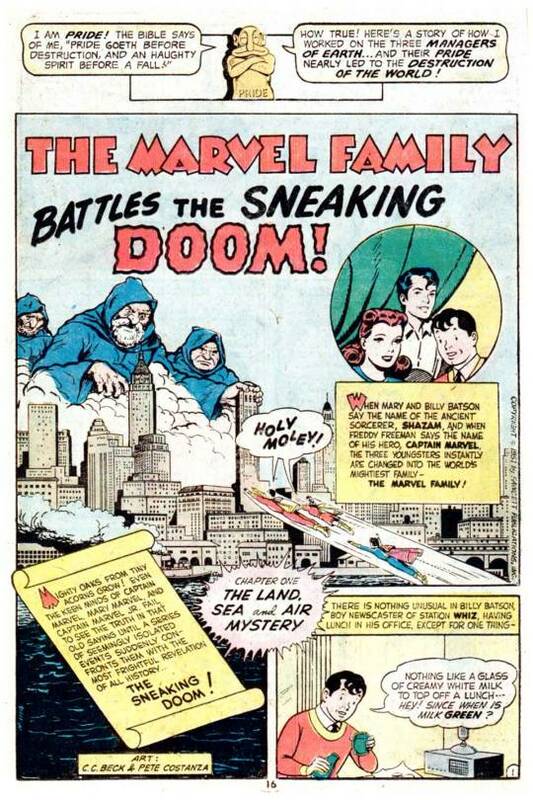 All of their meddling upsets the natural balance of the planet so greatly that the End of the World is the result–and the Marvel Family has to physically push the Antarctic ice cap 100 miles back into position to save it. A great story! Next comes another terrific story involving a selfish millionaire who buys the patents to fabulous inventions but never releases them to the public. Captain Marvel needs to convince him of the error of his ways. 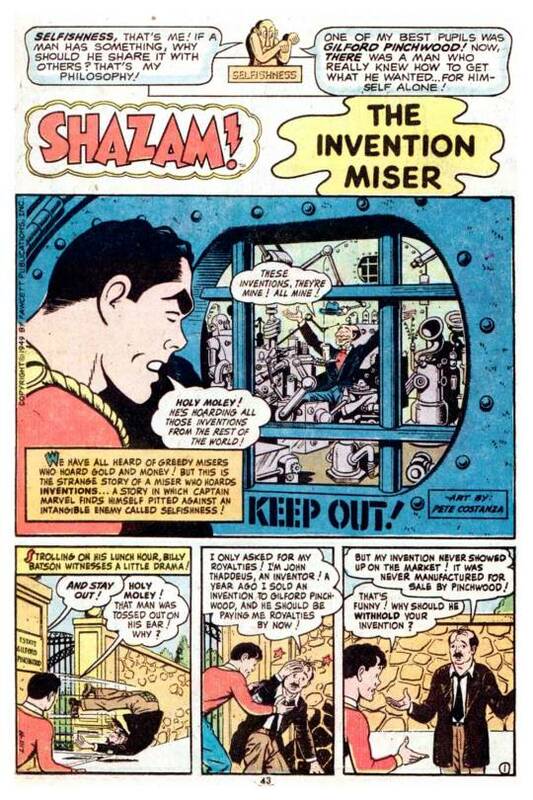 Then there’s a Captain Marvel Jr. adventure concerning a lazy Genie. And then, another fine story in which Captain Marvel contends with a hermit who hates the human race. 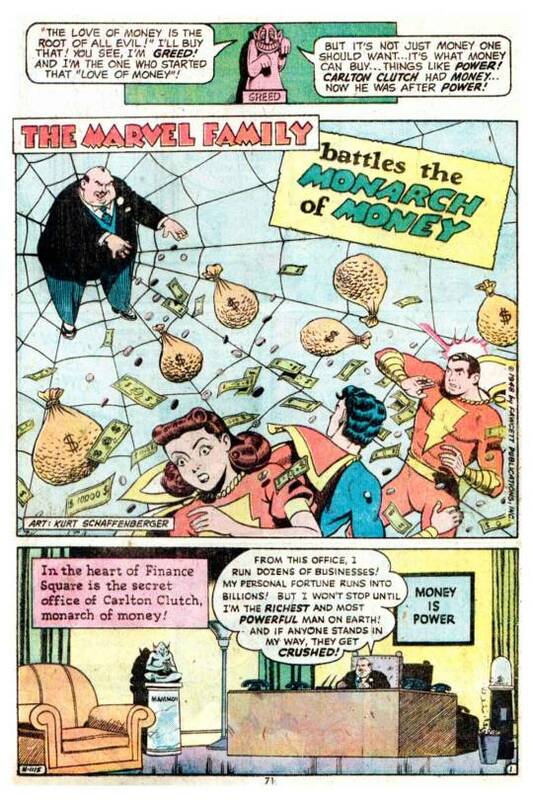 Next is another Marvel Family tale in which the trio takes on the world’s richest man, Carlton Clutch, a power-mad tycoon who has his sights set on taking over WHIZ-TV. It’s a surprisingly prescient story, but despite the tycoon’s best efforts, the Marvels foil him at every turn. And, in the end, he’s unable to escape because he doesn’t have a nickel for the train, his smallest bill being a thousand. 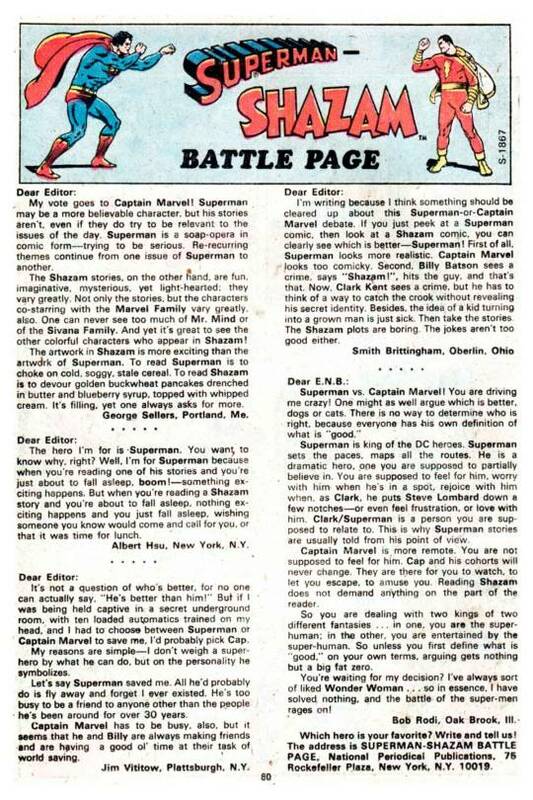 Thereafter comes another installment of the Superman-Shazam battle page, which had just about run its course. This one included a funny letter from Albert Hsu of New York that I can recall to this day. The final reprint in the issue was a story in which Captain Marvel was forced to literally contend with the Seven Deadly Enemies. Turns out, those things aren’t statues at all, but evil gods that Shazam had paralyzed and imprisoned centuries earlier. but now King Kull has brought them back to life and they run rampant across the world until Captain Marvel can best them. 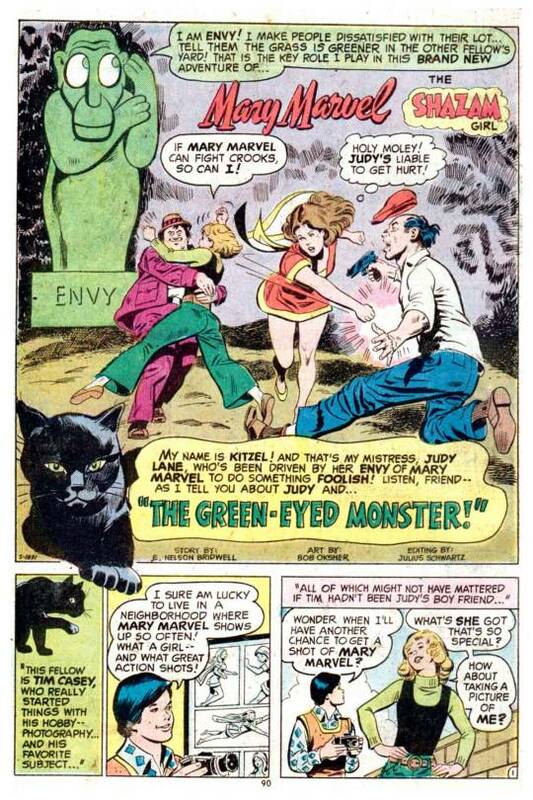 And the issue closes with another new story, this one a Mary Marvel tale illustrated by Bob Oskner. Oksner did the cutest and most attractive version of Mary, so it was a treat to get a story illustrated by him. Also wonderful is the ugly 1970s pattern shirt worn by photographer Tim Casey in the story.